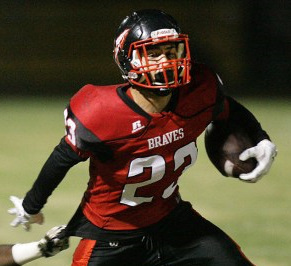 Norte Vista played again without leading rusher Chris Melesio but still handled Corona, 49-22, in Week 4. The Corona-Norte Vista Week 4 varsity football game on Thursday, Sept. 13, 2018, had us thinking that the Panthers had a shot until we saw them with the football. For Corona, an inability to run the ball or protect its quarterback led to quick 3-and-outs in the first quarter and a bunch of bad mistakes. Also, Panthers assistant coaches openly disagreeing at halftime about personnel groupings, one wanting to try something new and accusing the other of usimg ‘the same ol’ players over and over’. For Norte Vista, it was an easier victory than the Braves thought it would be, especially for their second game without senior Chris Melesio, who remains sidelined by a knee injury. A group of willing and talented runners has emerged to carry the load, however, and the team looks deeper and perhaps more dangerous than before the season. Rushing – Corona: Bartlett 9-17, Sheffield 1-6, Minnieweather 1-1, Gibson 1-0, Reyero 5-(minus-35); Norte Vista: Luckey 9-128, Allain 17-109, Hazem 11-75, Koshmerl 9-41, Gonzalez 5-27, Vasquez 1-5, Patino 1-3. Passing – Corona: Reyero 27-41-0-249; Norte Vista: Corey 3-3-0-75. Receiving – Corona: Gibson 11-118, 9-94, Klepach 2-30, Bartlett 4-7, Minnieweather 1-5; Norte Vista: Hazem 1-34, J.Gonzalez 1-32, S.Gonzalez 1-9.